FINALLY, the Rock (and about a dozen other WWE Superstars and Legends) have come back to the iPhone and iPad. Ok, so maybe it doesn’t have quite the same ring as when Dwayne delivers his spirited catchphrase each week on Monday Night Raw, but THQ’s WWE WrestleFest app for iPhone does deliver a lot of the fun and excitement of the WWE right to your pocket. WrestleFest is a very faithful remake of the 1991 arcade classic, right down to the graphics, art style, and 8-bit sounding music. However, THQ has updated the roster to include current WWE Superstars like John Cena, Randy Orton, and the Undertaker. Additionally, the game features the return of popular WWE Legends like Stone Cold Steve Austin, Macho Man Randy Savage, and of course, John Cena’s WrestleMania XXVIII opponent, the People’s Champion, The Rock. At it’s heart, the WrestleFest app is a true arcade button mashing experience. The screen features just two buttons, red for punching and blue for kicking, and a joystick to move your superstar. With the simplicity of the control scheme I was expecting a lack of variety in moves — but I was quite pleased to see that the game has incorporated a ton of moves for each superstar, and the type of move performed depends on the amount of fatigue of your opponent. I’ll admit, the first time I saw Shawn Michaels (one of the downloadable superstars) perform his Sweet Chin Music finisher, I was incredibly excited. And it’s not just traditional finishing moves that are featured, submission finishers are present too, like the Undertaker’s Hell’s Gate. This variety makes WrestleFest so much fun to play and really brings out each Superstar’s real-world personality. A moment ago I brought up downloadable content and THQ has promised a number of DLC packs for WrestleFest which will feature new Superstars and arenas. The first pack was released with the game for $0.99 and included Big Boss Man, WWE Champion CM Punk, Shawn Michaels, Sheamus, Triple H, and the Classic Survivor Series Arena. As more DLC packs are released, WrestleFest looks like it will build quite a roster of Superstars past and present. The other feature of the application I was pleasantly surprised with was the amount of depth in the Wrestlefest — namely the six game modes: exhibition, Road to WrestleMania, Royal Rumble, Saturday Night’s Main Event Tournament, Tag Team, and Gauntlet Match. Undoubtedly, most players will spend the majority of their time in the Road to WrestleMania career mode in which you attempt to take one Superstar up the ladder and win every championship in WWE. However, all the modes are a real joy to play and if playing against the AI gets old, WrestleFest supports multiplayer action via GameCenter. 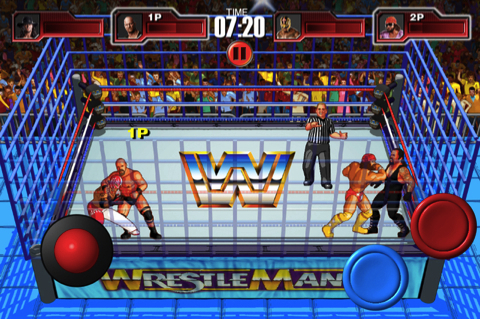 WWE WrestleFest for iPhone is the perfect game for any nostalgic WWE fan. It features an arcade type gameplay with just enough realism to keep any die-hard fan coming back for more. THQ has a winner with WWE WrestleFest, and that’s the bottom line, ’cause Stone Cold said so. Update: Version 1.05 adds Daniel Bryan, Mark Henry, Edge, Mr. Perfect, and Eddie Guerrero in a Champions Pack plus a new WWE Raw is War arena. 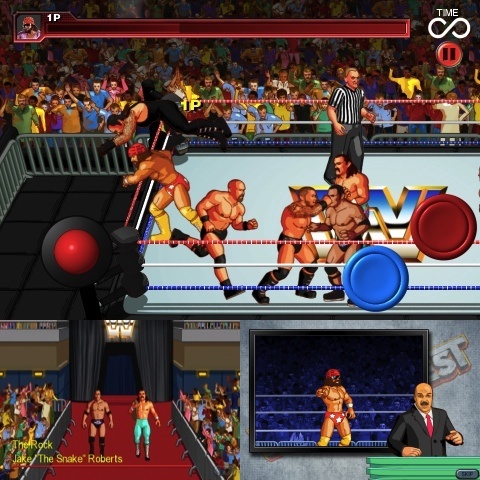 AppSafari review of WrestleFest Premium was written by Alex Seiver on March 1st, 2012 and categorized under Action, App Store, Arcade, Featured, Fighter, Fun, Games, Sports. Page viewed 6360 times, 1 so far today. Need help on using these apps? Please read the Help Page.